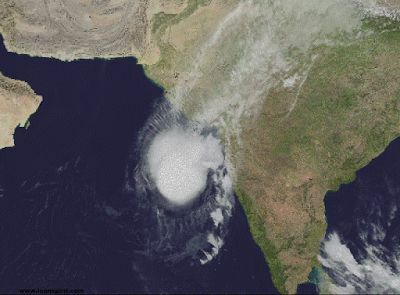 Heavy to very heavy rain very likely at isolated places over Andaman & Nicobar Islands; heavy rain over south Gujarat state, north Konkan and north Madhya Maharashtra. Squally winds speed reaching 50­60 gusting to 70 kmph along & off north Maharashtra and south Gujarat coasts and 40­50 gusting to 60 kmph around Andaman & Nicobar Islands. Strong surface winds speed reaching 25­35 kmph gusting to 45 kmph likely over parts of south Gujarat region, interior parts of north Konkan and north Madhya Maharashtra. Sea conditions are very likely to be rough to very rough along & off north Maharashtra and south Gujarat coasts and around Andaman & Nicobar Islands. Fishermen are advised not to venture into Sea along & off south Gujarat and north Maharashtra coasts and around Andaman & Nicobar Islands; and not to venture into deep Sea off north Tamilnadu and south Andhra Pradesh coasts. Heavy rain very likely at isolated places over Andaman & Nicobar Islands. Squally winds speed reaching 40­50 gusting to 60 kmph around Andaman & Nicobar Islands. Sea conditions are very likely to be rough to very rough around Andaman & Nicobar Islands. Fishermen are advised not to venture into Sea around Andaman & Nicobar Islands and into deep Sea off north Tamilnadu and south Andhra Pradesh coasts. Heavy rain very likely at isolated places over south coastal Odisha and north coastal Andhra Pradesh. Fishermen are advised not to venture into Sea off north Tamilnadu and south Andhra Pradesh coasts. ओखी चक्रवाती तूफान गुजरात और महाराष्ट्र पहुंच चुका है. इससे पहले यह तूफान तमिलनाडु, केरल और लक्षद्वीप में तबाही मचा चुका है. इसका असर मुंबई और उसके आस-पास के तटीय इलाकों में नजर आ सकता है.